My boss warned me at the end of summer that sickness was coming. He, the seasoned parent of eight children spoke with experience when he told me I only had a few weeks of health left. "The kids go back to school for a few weeks and start spreading germs around," he said,"Then they take those germs back home and spread them to siblings and parents until everyone with kids is sick." I laughed, a little anxiously, and hoped he was wrong. As I sniffle my way through this post, grateful, I guess, for the tiny bit of my nose that is clear enough to breathe through, it definitely seems like he was right. Like clockwork, a few weeks after school started something started to circulate around day care, and it was at our house before you could say, "achoo!". Luckily, it's not terribly miserable, although it is miserably long-lasting. My daughter has been in the recovery phase since the end of last week, and it looks like one of these days hopefully I will, too. That's partly why we've been all about the comfort foods at our house lately. When you've got the chills and a so-so appetite to begin with, you're not about to mess around with an asparagus salad. Barbecue beef, however, is like getting a hug from a friend. It's warm, inviting, and something you never get tired of. This recipe in particular is a favorite because it is simple, but tastes incredibly complex. The secret ingredient is the pickling spices that you tie up in a piece of cheesecloth and use to flavor the beef while it cooks to tender bits. 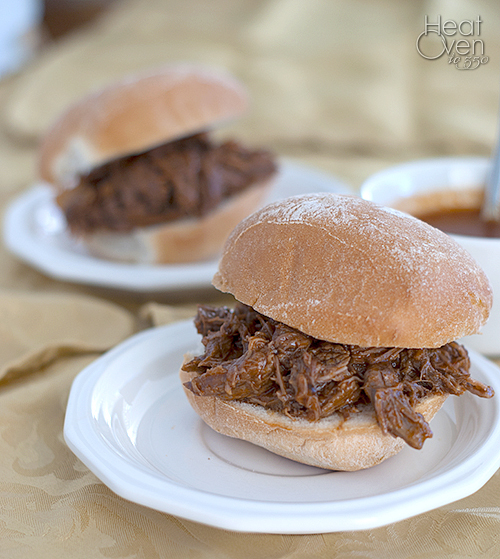 It adds amazing flavor that is unlike any other barbecue I've tried. The rest of the ingredients are very simple and straightforward, making this an easy recipe with very little hands on time. It's great this time of year when there is starting to be a chill in the air and you welcome using your oven for a few hours at a time. The finished beef is perfectly tender with a perfect tangy/sweet/complex sauce. Even if you aren't sniffling your way through this fall, it would be a welcome addition to any dinner table. Heat oven to 300 degrees. Using a small square of cheesecloth, make a sachet by tying the tablespoon of pickling spice in the piece of cheesecloth. Set aside. Heat 1 tablespoon of the oil in a dutch oven over medium heat. Season the beef pieces with salt and pepper and brown half of the pieces in the Dutch oven until browned on all sides, about 6 minutes. Remove the browned pieces to a bowl, add another tablespoon of oil and brown the other half of the beef pieces. When the second batch of beef has been browned, pour the water into the Dutch oven. Return the first batch of beef to the pot. Bring to a simmer, then cover and place the pot in the oven. Let cook until beef is almost tender, about 1 hour. Stir in ketchup, vinegar, mustard and sachet of pickling spice. Cook until the meat is very tender, about another hour. Throw away the pickling spice sachet and transfer the meat to a cutting board. Once it is cool enough to handle, shred the meat into thin shreds. Meanwhile, pour sauce from the Dutch oven to a gravy separator and let sit 10 minutes. When beef is shredded, return it to the pot. Pour in de-fatted sauce to taste. Season with salt and pepper. Serve on hamburger buns. That looks terrific! Your recipes always look so amazing. Awww, hope you're feeling better soon! I'm already not looking forward to the cold I'm sure to get at some point this fall or winter... This definitely looks like the perfect comfort food! Thanks for sharing this post. I'm using this oven for better cooking. When I'm not feeling well, the last thing I want is salad. You're so right about the comfort foods, and this meal would make me so happy! Colds are the worst! I hope you're feeling better by now. 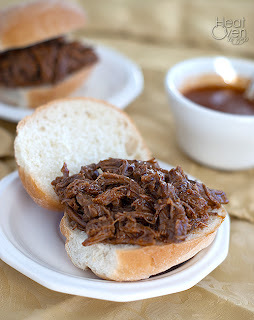 I love anything with barbecue and I've been trying to cook with more beef, so this sounds perfect. Can't wait to try it! I bought a new oven last month. I would recommend you to buy the same. barbequing would be definitely my style of cooking and thta too in my new oven. Hope my family likes it.